Susie sings and swings with a lush tone and playful rhythm. In her youth, she began to explore the world of jazz through the recordings of Nancy Wilson, Joe Williams, Ella Fitzgerald, and Billie Holiday In her late teens, she took the bus to the Statler-Hilton in downtown Buffalo to hear jazz greats such as Earl “Fatha” Hines and Kenny Burrell. These sessions inspired her to continue voice lessons and perform in local venues. Susie began performing professionally with a dinner theatre group in the mid-1970s (earning $7 a night!). Exposed to the creativity of Cole Porter, Irving Berlin, and Rogers and Hart, Susie became smitten with the words and music of their compositions. She now performs as a duo and with a quartet in the Philadelphia area clubs and cabarets. Susie’s warm and effortless articulation puts an intimate spin on her jazz repertoire. This CD features Grammy Award winner Brian Lynch as special guest. 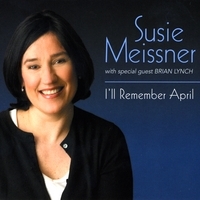 Gently swinging vocals illuminate a classic repertoire in the new cd “I’ll Remember April” from Susie Meissner, available on Lydian Jazz Records. Renditions of “What a Wonderful World”, “You’d Be So Nice to Come Home To”, and “I’m Old Fashioned” generate comfortable warmth; “I’ll Remember April”, “There’s A Small Hotel”, and I Remember You” suggest travelling with Susie would be fun to. The recording dynamics give every note a roundness that supports the mood. On several tunes, Brian Lynch (trumpet), Greg Riley (tenor sax), and David Mann (alto sax) accompany the vocalist. The album highlight comes on “Little Girl Blue” where empathetic support and an extended Lynch solo allow Meissner to transform the mood from lonely wistfulness to heartache and despair. John Shaddy provides delicate support throughout on piano assisted by Rob Williams on bass and Abe Speller on drums. “They Say Its Wonderful” an ending vocal/piano duet says it all. Warm and winsome, this disc is largely a unpretentious, swingy romp through familiar territory. Ms. Meissner is a sweetly, straight-ahead alto - and a perfect fit for this group of straight-ahead standards. She’s doing more than singing notes - she’s a fine interpreter of the lyrics as well - making sure the story of the song is told. Besides Mr. Lynch, the backing group includes David Mann on Alto Sax, Greg Riley on Tenor Sax, John Shaddy on Piano, Rob Williams on Bass and Abe Speller on percussion. “I’ll Remember April” is a comfortable presentation of familiar songs by a talented singer.